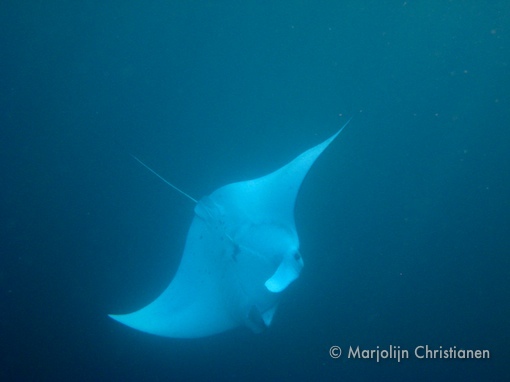 Seeing a Manta is one of the most magic moments you have ever experienced. On a lot of places around the world there is no guarantee to see them. In my experience I have only been to two spots where you are almost guaranteed to see them every time you go: Raja Ampat and Sangalaki. At Sangalaki I have never missed them and you can see them both snorkeling and diving. Snorkel a few hours after the tide has started to come up. Manta’s feed on plankton here on the north-west side of the island. They are usually present in numbers up till 50 on days with big tidal differences. Go diving at these points and you can also encounter them underwater. The coral cover has drastically decreased in the last years but you still can see big schools of black snapper, batfish. It is also not difficult to find some turtles, sepia and the funny gardeneels here. Getting there takes about an hour from Derawan and will cost 7-800.000 Rupiah for a boat that takes four. The island used to have a resort and the beaches have a lot of turtle nesting. It used to be a good spot to have lunch but now people are sometimes chased of the Island or asked to pay. You can also combine it with going to the jellyfish lake on Kakaban.